Ahhhh, I remember "Sleep-over at Annette's." Wasn't one of the bullies called Eileen. It's hard to picture a mean girl called Eileen? Maybe because of Dexy's Midnight Runners? Speaking of music, I will give Margot a go! Wow, I have not heard "Come On Eileen" in a long time, and props for remembering the band. By the way, one of the other girls is named Audrey, which is also a nice name (although that might just be the Little Shop of Horrors talking). 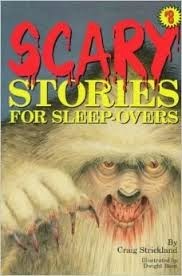 I just finished reading all of your reviews of Scary Stories for Sleepovers and you had me laughing out loud. You have a delightfully snarky turn of phrase and you make great points. Wonderful. I'll admit that a few of the comments stung a bit but they were fair. Thanks for taking the time to read and review this old series. It was fun. Thanks so much for the kind words. I was always a bit frightened that an author would stumble upon my blog (which relies largely on insult humor), but I'm really glad I was able to make you laugh. And this series, despite having a target audience younger than I, was entertaining and engaging, and I'm glad I read it (and not just for satirical reasons, either). So thank you for your work and thank you once again for your kind words. Much appreciated.